Ian Gibson's sterling silver bloom comes packaged on plantable paper filled with wildflower seeds. Little does this sweet flower necklace know, but she's surrounded by her future friends. 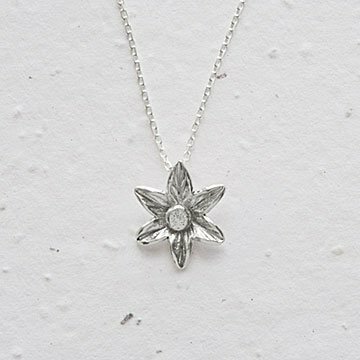 Ian Gibson's sterling silver bloom comes packaged on plantable paper, which means when you put it in a pot full of soil, wildflowers will grow. The card is full of non-GMO annual and perennial seeds, like Bird's Eye, Snapdragon, and English Daisy. Soon, you'll have a colorful little garden to enjoy, knowing its inspiration is hanging beautifully around your neck. Handmade in Pennsylvania. Ian Gibson's jewelry is completely handmade in his studio in the heart of Philadelphia. Completely self-taught in the art of jewelry fabrication, Ian's fascination with metals formed from a schooling in geology and a desire to work with his hands. Combining sterling silver and 14kt gold fill metals with gemstones and pearls, he seeks to create designs that are organic and have an artisanal essence. His commitment to his craft is never ending and his creations mirror this evolution. After setting their traveling bags down, Ian and his wife Jessica founded their own studio in 1999. They are joined by a talented staff of local artisans. The studio is filled with the sound of hammers, sanders, and laughter, and every person makes each piece as if it were a gift for someone dear to them.